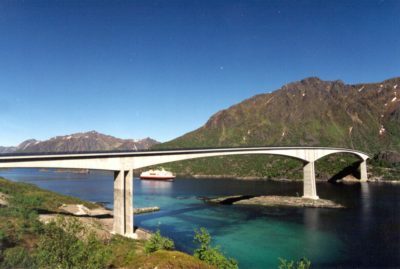 Gulli Bridge is the first concrete box girder bridge built in Norway using the incremental launch method since the 1980s. 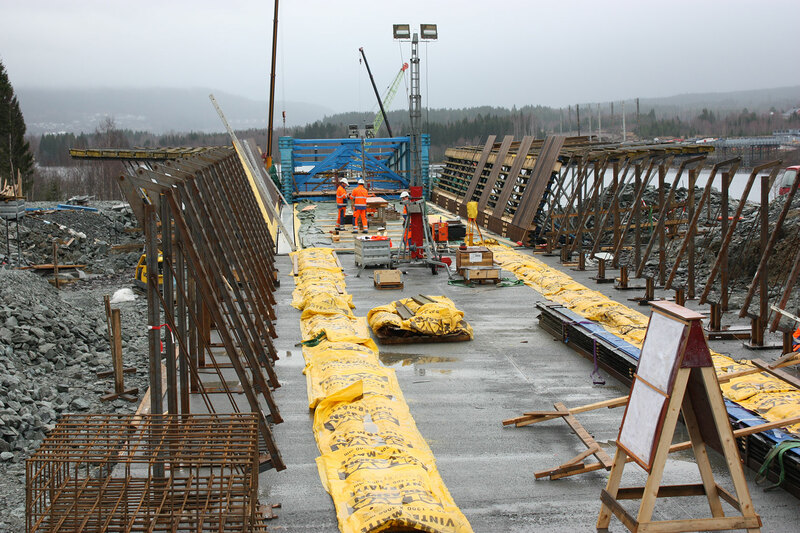 Two alternative solutions were designed for the tender: Construction of the superstructure using a movable formwork carriage, or alternatively construction using the incremental launch method. Tenders were submitted for both alternatives, but construction using the incremental launch method ended up as the preferred solution. The incremental launch method involves constructing the superstructure in sections behind one bridge abutment, then pushing it out over the next column axes. 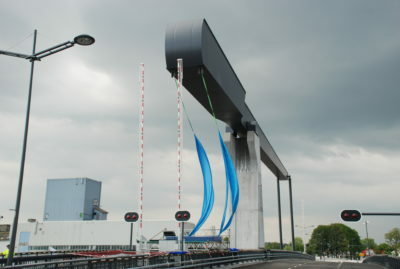 In front of the concrete box girder being pushed, there is typically a steel launching nose which reduces the load on the concrete box girder while it is being launched. 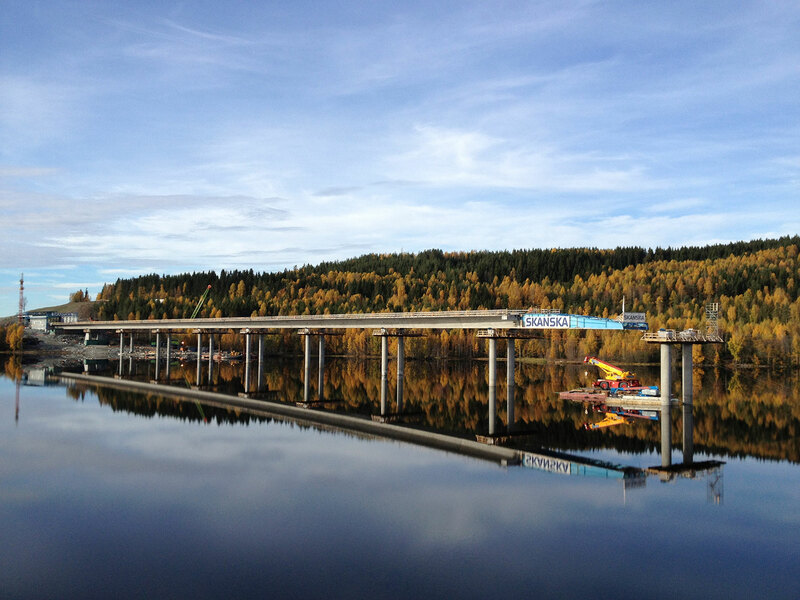 Aas-Jakobsen was responsible for designing the substructure and superstructure for Gulli Bridge. 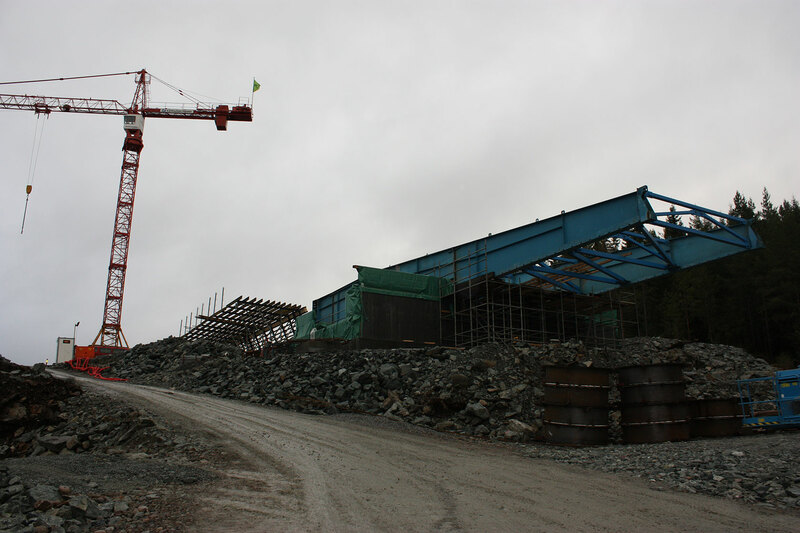 The engineering was performed in partnership with Geovita AS, who was responsible for the geotechnical design. Aas-Jakobsen performed the conceptual engineering, detailed design and provided supervision during the construction phase. 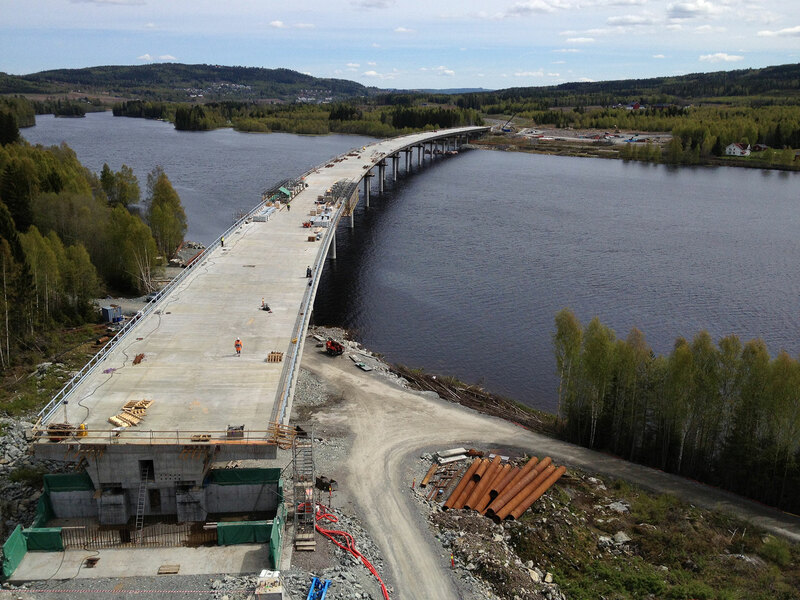 Gulli Bridge forms part of the new Slomarka to Kongsvinger section of the E16. 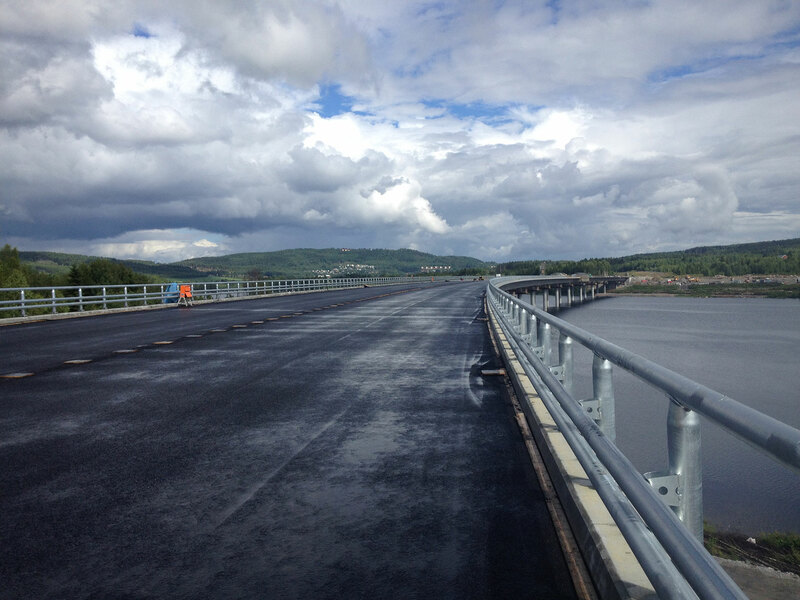 The bridge is a four-lane concrete box girder bridge whose central portions cross the Glomma River at the border between Kongsvinger and Sør-Odal in Hedmark. The bridge has 16 axes, typical spans of 51 metres and a total length of 741 metres. A casting plant was set up to manufacture the superstructure behind the first axis, and the superstructure components were produced here in 30 sections, with a typical length of 25.5 metres. The sections were cast and pushed forward at two-week intervals. The launching jacks were fitted to the top of the axis 2 column, which meant that the columns in this axis had to be temporarily reinforced. 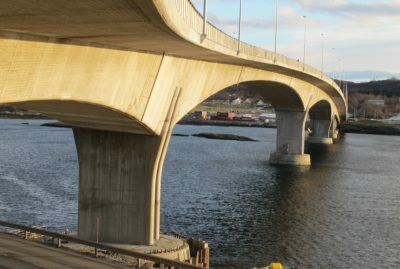 The bridge superstructure rests on circular columns which are 1.7 metres in diameter. 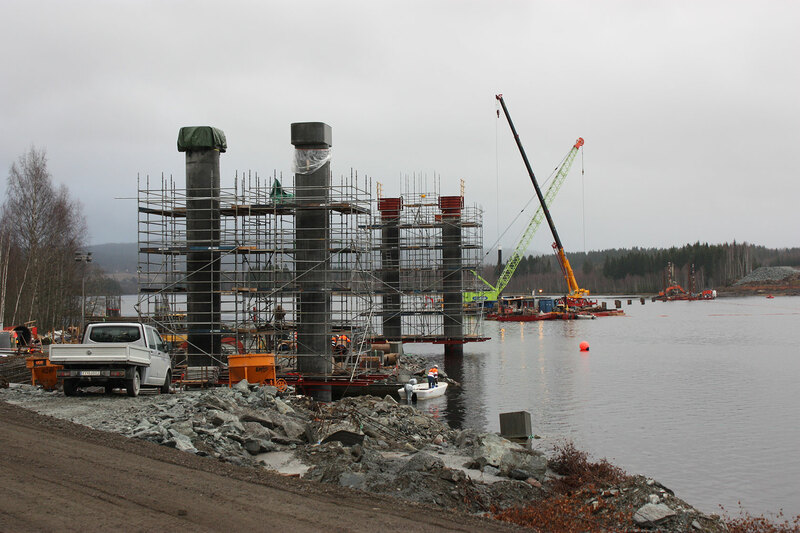 On top of the columns is a capital of 2.5 m x 1.7 m, which provides space for the temporary bearings and jacks, and finally replacement by permanent bearings. The top of the foundations is at the same level as the existing river bed, the foundations typically being steel pipe piles driven to rock. The water depth and subsequent depth to rock is typically 5-10 metres. During a period of collaboration, the contractor expressed a wish to modify the structure to suit his equipment. The span lengths were increased from 40 metres to 51 metres, and the number of foundations in the river was thereby reduced. The change led to a hectic period of design work, which resulted in savings for both the Client and Contractor. The drawings and bar bending schedules which were submitted were of an very high quality, demonstrated by the fact that during the entire construction period, there was only one revision to the bar bending schedules. The project was a success for both the Client and Contractor, and in 2015 the project was awarded the Betongtavlen ‘Concrete Tablet’. The jury’s comment on Gulli Bridge was: ‘Gulli Bridge is being awarded the 2015 Betongtavlen because it is an excellent role model for future bridges - both in terms of design, execution and implementation”. E16 Fulu-Gulli builidng cost ca. 330 MNOK. Design cost ca. 9 MNOK.